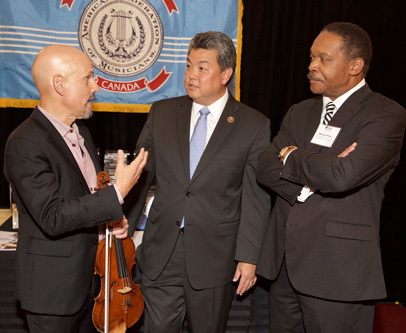 This year, with the participation of RMA, the American Federations of Musicians stepped up to share our musicians’ narrative in the halls of Congress. Given a green light by President Ray Hair, our team consisted of Alfonso Pollard, AFM Director of Government Affairs, Marc Sazer, violinist and RMA President, Gail Kruvand, bassist from the New York RMA and Local Executive Board, and Ed Malaga, President of the Washington D.C. AFM Local. We spent weeks gathering resources, preparing to bring our story to Congress. Our great thanks to Booker White (Walt Disney Music Library) and Mark Graham (Joann Kane Music Service) for sending scores and cue sheets for top film and tv titles. Andie Childs at the AFM West Coast Office compiled and shipped literally hundreds of AFM soundtrack CD’s. One of our key messages was that the musicians who are able to make a middle class living in film/tv are also teaching our children and performing in public, providing cultural equity to our society literally “beyond the red carpet”. We appreciate organizations like the Harmony Project, Education Through Music Los Angeles and Mostly Mozart, which contributed materials. Finally, a special thanks to Bruce Dukov for creating an original arrangement of the March from Indiana Jones for the event – it was a great hit! Our booth was one of many, but attracted wide attention in the room. Fellow exhibitors from film studios and other unions joined a number of members of Congress and their staff in dialogue with us. We were able to share who and what we are, and field interested questions from both sides of the political aisle in Congress. Several films were the featured promotions of major studios. Twentieth Century Fox devoted their booth to Blue Sky Studios and the Peanuts move, Sony led with Goosebumps and Disney sent several Star Wars characters to circulate – it was great to be able to point out that these were all scored AFM, and our studio friends reciprocated by helping us meet people in the room. We are thrilled to have had such a premiere opportunity to promote our people, our success and our economic and cultural contributions to our U.S. Congress.